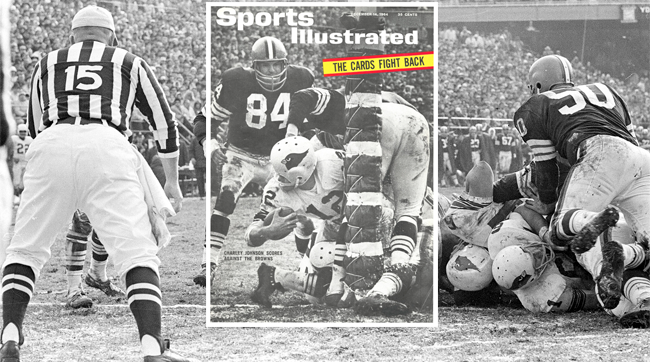 The cover of the Dec. 14, 1964 issue of Sports Illustrated features an iconic image for a bygone era of the NFL. Charley Johnson, the 26-year-old quarterback of the St. Louis Cardinals, lunges into the end zone. A Browns defender hurls his body over him, and a Cardinals lineman is sandwiched underneath the pile. Chunks of grass fall onto the mangling of limbs at Busch Stadium. And right in the middle of it all is the ultimate occupational hazard: the goal posts. “It affected the game quite a bit,” says Johnson, who retired in 1975 and went on to become a chemical engineering professor at his alma mater, New Mexico State. Using the goal post to his advantage, Charley Johnson sneaks into the end zone. When the NFL was founded in 1920, it used the ‘H’ design for its uprights and placed them on the goal line. In 1927, the league moved the posts back 10 yards, to the back of the end zone. The reasoning? That’s what the NCAA did. At the time, the NFL simply followed the college rulebook. But that was short-lived. In 1933, the NFL finally wrote its own rulebook. And in an effort to increase field goal attempts—the general feeling was that there were too many ties—the NFL moved the uprights back to the goal line. If a pass hit the metal uprights, it would automatically be ruled incomplete. This was famously applied in Super Bowl VII when, in the fourth quarter, Washington quarterback Billy Kilmer missed a wide-open Jerry Smith in the end zone and bounced the ball off the post. The Dolphins won, 14-7, though it should also be noted Kilmer was intercepted three times that day. A new wrinkle was introduced in 1967. Joel Rottman, a retired newspaper distributer and a hobbyist inventor, was having lunch at the Queen Elizabeth hotel in Montreal with his friend, Alouettes coach Jim Trimble. After staring a bit too long at his fork and imagining what it would look like if the two inside prongs were knocked out, Rottman blurted out an idea: what if the football goal post modeled a fork’s shape? According to a 2010 account in the Florida Sentinel, Rottman believed “slingshot” goal posts would be more aesthetically pleasing—and a bit safer. Rottman brandished his new invention at Expo ’67, the world fair held in Montreal, and earned a meeting with NFL commissioner Pete Rozelle. In the years to come, the kicking game became too commonplace. In 1973, a record 543 field goals were made on 861 attempts—an average of five per game. 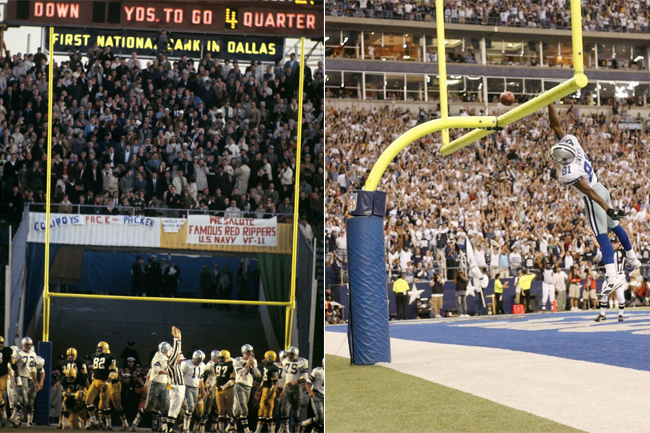 Field goals accounted for 23% of the scoring that season, compared to 15% in 1969, the NFL’s last year before the AFL-NFL merger. Owners wanted more touchdowns. When players returned from the 1974 strike, they found the goal posts in the back of the end zone, which did the trick to curtail the kicking game. In 1974, only 335 field goals were made—or 15% of the scoring. For the last 42 seasons, the NFL hasn’t found a reason to revert—and it likely never will given the safety issues.